Can I control which videos show up on other devices with device sharing? Videos that have been uploaded to your Cloud will always appear on other devices that are logged into your RealTimes or RealPlayer Cloud account. - Click the logo in the upper left and select Preferences. - Click Library & Device Sharing in the left pane. - The default is Private, which means other devices that are signed in to the same account can access videos on your PC; to prevent devices from seeing any of your PC videos, select Disable. Under "Watch these folders" you can remove specific folders from the list so that RealPlayer won't look there for videos. 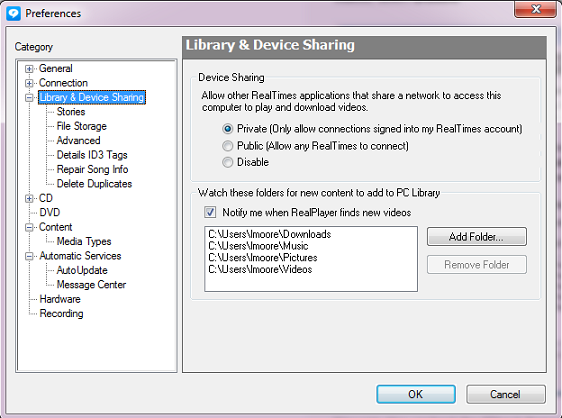 Note: If you change your preference from the default (Private) to Public on your PC, then all PC videos will appear on other devices connected to RealTimes or RealPlayer Cloud using the same network.